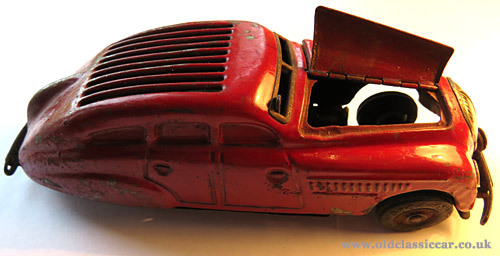 Schuco 1750 tinplate toy car (Tatra style). Schuco 1750 car (& related copies). 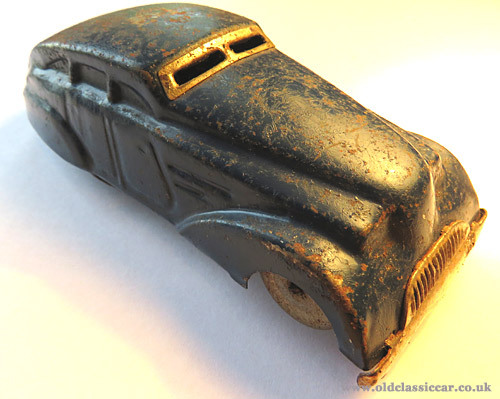 This well-detailed Schuco tinplate toy I think dates to the late 1930s, but was produced for a good number of years after the war also. We found this one at a toy fair around 15 years ago, and looking around online it would appear that the early versions, with the grilles set into the roof, are relatively scarce. 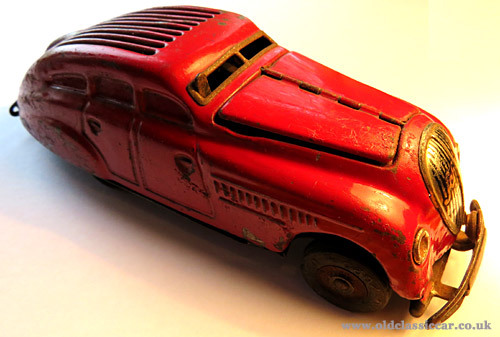 The overall design of this clockwork-powered toy looks to be based on the Tatra T97 of 1936-1939, a silhouette that continued in production following the war as the T600. Post-war Schuco toys were labelled as being made in "US Zone Germany", this though just has "Made in Germany". The tyres bear the legend Schuco Anno 2000 - this particular version was voice-activated, relying on the air from the child speaking into the slots in the roof, to control the car's movement. However photos of the 2000 I've seen, have 'A.D. 2000' on the front numberplate, whereas mine simply has 'Schuco'. Presumably this is a simpler version, sold alongside the Anno 2000 perhaps as a cheaper alternative but also using the same body pressing. The Schuco 1250 is another version of the same basic design. The paintwork is the original red finish, while the bumpers, headlamps, windscreen surround and grille all bear the remnants of a plated finish. Both sides of the bonnet open. There's an operating lever poking out of the windscreen aperture, while the rear bumper slides in and out, also acting as a switch. I've only just noticed that the front spotlight slides left and right, operating the steerable front wheels. Various different versions of this car were produced by Schuco, all having slightly different features. I think my car was originally supplied with a tin garage. 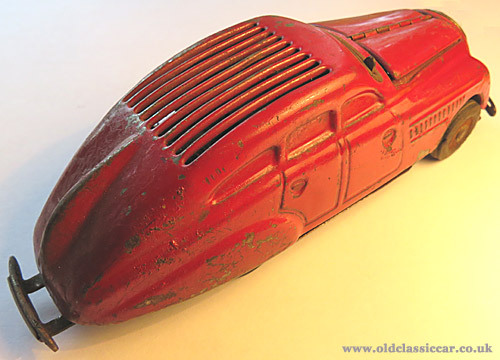 There are a number of old toys in circulation that appear to have been based on this toy's bodyshell design/tooling but are somewhat simpler, three examples of which are also featured on this page. It'll be noted that the pressings and features are much more distinct on this early toy, compared to the cheaply-made later alternatives. Copies using the Schuco design. A number of toys produced by other companies, share the basic silhouette of the Schuco 1750. Maybe Schuco sold-on the tooling once they'd introduced new toys to their line-up? The first, a blue car, also has a clockwork mechanism although the position of the key hole is different to that on the Schuco original. The features pressed into the tin body are less distinct than those on the original too, and the grille/bumper is a much simpler one-piece design. There is no rear bumper, the roof is solid, and the Tatra-esque fin on the rear is much less pronounced. Underneath, the wheels are different and in fact the entire lower pressing has been revised, to accommodate a different motor and the single, central, "steering" wheel. A "Made in England" legend is barely visible on the base. 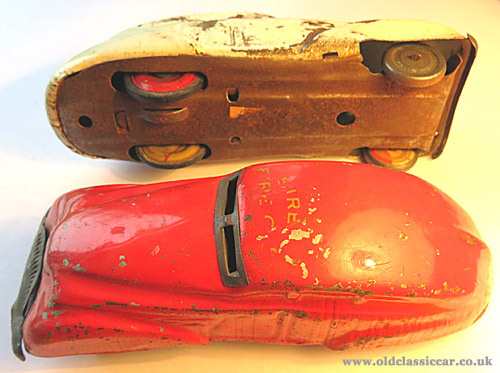 The red and white cars are more basic still, and instead of a clockwork motor have simple friction-drive arrangements which incorporate wheels of a larger diameter at the rear, made of tin with rubber "tyres". The detailing in their body pressings is even more vague than on the blue car. The red car sports the remains of a transfer on its roof, which I think reads "Siren Fire Car", a reference to the odd noise that the friction motor makes. All four cars are in very playworn condition, and are all the better for it. Other old toys featured in this section of OCC include the Schuco 1070 racing car, and a very original Schuco Mercedes grand prix car.